Isshuukan Friends. has been published in English as One Week Friends by Yen Press since December 19, 2017. It has been licensed in Spanish by both Panini Manga México and Ivrea Spain. I started to read this manga because I was fairly interested in the development of Hase and Kaori's relationship after watching the anime. If that's the main reason why you're thinking about reading this manga I can reassure you that it will be a waste of time. First of all I can only state my opinion after jumping into this manga after I have finished the anime. I really liked the anime and how the characters where interacting with each other which is why I wanted to give the manga a try. The art still mainly stays the same but the way the mangaka illustrates the patterns is quite disturbing. The story is told more like an omake. There are some more information that are added but don't really change the conclusion. The anime basically covers the whole manga's story but is told in a more suitable and likable way. The art without being of my favourites its good enough not excellent but well made. The main characters are good developed maybe a little bit longer it could be better, what i feel its that some things get dropped but not resolved, but at least they struggle with their feelings in a good way. the supporting characters are very poor. The mangaka leaves some ideas about them but never develops anything and only use them to fill, at least two of them. The idea is quite interesting and some of the feelings during the story are well driving but the way the manga comes to an end look pretty vague it's only i can say without making any spoiler. And the way some other things are resolved are mehh. Having read 11 chapters, I have given this manga an overall rating of 8. I have greatly enjoyed reading it and wish a lot more chapters had been released. PROS: I like the fluffy art-style, I enjoy the story, the characters are cool people, the story progression so far has been good and well paced and its 4koma style fits it well. CONS: It releases rather slowly (though this is probably the translator's fault) and there are some minor plot holes when dealing with the girl's memory capabilities. The first chapter is a very good indicator of what the rest of the chapters feel like and thus, just reading that one should be a clear indicator of how much you may enjoy the rest of the chapters. I would highly recommend this to most people who like shoujo manga and want a very cute story with romantic elements where the boy works hard to gain the trust and love of a very reserved girl. This manga honestly took me by surprise. I'm not normally a fan of manga or anime like this, but I was surprised to find myself captivated by One Week Friends. 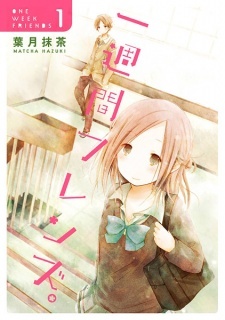 In a nutshell, One Week Friends is the story of a girl named Fujimiya Kaori, who loses all memories of her friends every week, and boy named Hase Yuuki, who decides to make friends with her every week, despite her forgetting all about him over and over. Looking at that overview, I didn't expect the story to offer much, but boy was I wrong. The manga kept me rooting for the characters the whole time, hoping beyond hope that by some miracle, Kaori wouldn't forget her friends, and that Yuuki would finally express his true feelings. The twists in the plot kept me eagerly awaiting the updates and for that reason alone, the manga is worth a shot. The reason I only gave the story a 7/10 is because between the exciting events and plot twists, not much really goes on, and often it takes a while for the story to pick up the pace. None the less, a good story line. The art style certainly came across unique, almost pink and fluffy at times. However, it never failed to capture the 'dramatic' scenes, and for that reason an 8/10. I'd give it more points, but occasionally it came across as fairly basic, for that reason, only 8. The characters fit in perfectly in this manga, all with different personalities and traits, as well as individual roles in the story. I like how the story doesn't always revolve around Kaori and Yuuki, but also involves their friends Shougo and Saki. 8/10. Overall, I would recommend reading this manga, or at least giving it a shot. It's a true test of friendship, which will leave you crossing your fingers for the characters.